Hi there, I hope you had a good weekend 🙂 Yesterday was Father’s Day with a difference in our family as it was also my nephew’s christening! I am little Harry’s Godmother now!!! I’m pleased to say everything went perfectly and we all had a lovely afternoon 🙂 All the ‘dads’ in the family had a great day too! Today I’m sharing this card that I made for my sister to give to our dad (who has, incidentally, got a moustache!) I used a topper from one of Hunkydory’s Little Books called Charming Chaps and teamed it up with gold mirror card, black Adorable Scorable card and patterned papers and card from a Hunkydory range called Fan-tash-tique! I made the sentiment up on the computer and used Spellbinders dies to mount it on. 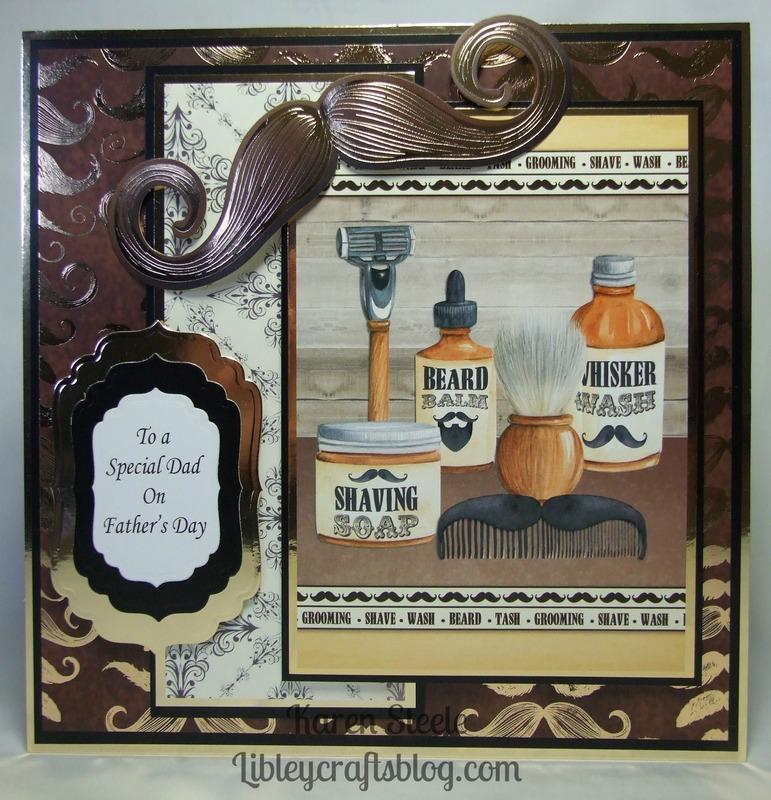 What a fab Father’s Day card for your Dad who has a mustache! And, you are so kind to make cards for those in your family to give other in your family! Great card…love it! This is great – I love all the mustache stuff! Congrats on being a Godmother! Happy first day of Summer! Ooh I wanted this set, but I never got around to buying it. You have made something marvellous with ii! As always I love the composition of your card. Awesome masculine card…perfect Father’s Day card! Love the fun mustaches! Perfect masculine Card, Karen – it looks a bit vintage- like that !